With its warm climate, safe environment and wide range of activities, the Algarve is a great destination for children of all ages. An ocean life theme park, water parks, go-karting and adventure golf facilities are just some of the attractions on offer. In the evenings under 18s are welcome to enjoy karaoke, live music and games machines in many of the pubs until a reasonable hour. Bus services are often organised from the resorts to the parks, all of which also have ample car parking if you choose to make your own way, and toddlers often get in free. Refreshments will usually be available inside but can be very expensive. Aquashow Waterslide Park The park includes a massive wave pool, superb water slides and mini golf. Aquashow is situated on the N396 as you turn off the main N125 road for Quarteira. Tel: 00 351 289 389 396. Zoomarine Zoomarine is an exotic marine life theme park home to hundreds of fantastic and fascinating sea creatures. The park includes dolphins, sea lions, turtles, a shark, a museum and an alligator farm as well as a mini-zoo, exotic birds and tropical fish. Krazy World Krazy World has a Crazy Golf course which features a whopping 36 holes. There is a petting farm where you can hold snakes, take pony rides, touch camels, kangaroos and parrots. Swimming pools provide the opportunity to cool off. Aqualand Waterslide Park Formerly known as 'The Big One,' Aqualand has spectacular gardens and is probably the largest waterpark in the Algarve. Slide & Splash Waterslide Park Slide & Splash Waterslide Park is one of the best waterparks in Europe and one of the most popular waterparks in The Algarve. It is an ideal park for both young and old. This water park offers long curly slides and fast straight slides. 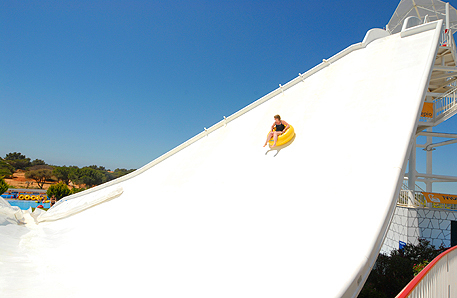 Slide & Splash is located near Estombar, to the west of Lagoa, on the main N125 road. Call free on 00 351 282 341 685. Karting Almancil Almancil Karting was started in 1992. It is a leisure and competition complex that is available for all lovers of the most accessible motor racing sport - karting! Lagos Zoo Located in its own beautifully landscaped gardens between Barao de S. Joao and Bensafrim, Lagos Zoo has a 60m flight tunnel for the observation of exotic birds. In here you can also find the monkeys' island and children have the opportunity of close contact with a variety of domestic and farm animals. The zoo also has a souvenir shop and a restaurant offers meals and snacks. Parque Aventura Situated in Santa Eulalia, Albufeira, Parque Aventura comprises of a paintball centre and various adventure courses through the trees made up of zip wires, bridges and ropes. The assault courses and games are suitable for children of 4 years and older with varying degrees of height and difficulty and are all supervised by qualified instructors.